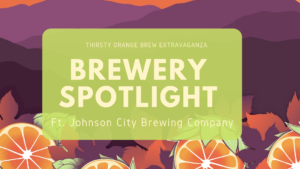 Brewery Spotlight ft Johnson City Brewing Co. This weeks brewery Spotlight features Johnson City Brewing! Thirsty Orange got to have a fun conversation with founder & owner Eric of Johnson City Brewing. Read below for the interview! Thirsty Orange: Tell us how Johnson City Brewing came into existence. Eric: It’s really simple… I was a homebrewer. Back in 2014, my wife and I decided to start the first brewery in Johnson City, TN. We never started it because we thought I made the best beer, we wanted and liked how craft beer brings people together. That was the centerpiece for us! Have you been to thirsty orange before? Since we’ve been open, we’ve been every single year! What is your favorite thing about TO? All the wonderful craft beverages coming together (not just beer, but cider too). Getting back to the main premise on which we started our brewery, it’s a very community based festival. To have a festival where you bring people on our community and people outside our community to see show off our community. Not just the brewing community, but all of Johnson City. It’s a great opportunity showcase what we do. We are the longest running and also the smallest. We pride ourselves on doing a lot of experimental stuff. What are your favorites beer right now? My favorite beer is always what I haven’t tried. Anything new! What’s the collaboration within the beer community like in JC? There’s a spirit of collaboration in the brewing community. We do a ‘Try Local Beer’ which has always been a collaboration beer. Brewing this years Try Local at Great Oak and it will be ready for Craft Beer Week! It will released the day before Thirsty Orange, so Thirsty Orange attendees will get the opportunity to taste this very special, limited time beer before anyone else! -German Style Pilsner. It’s crystal clear & refreshing. -Biscuits & Jam. EPA. We use a German malt for base. We are using Barb Rouge Hop. Over 300 variety of hop around, this one hop imparts a jammy red berry flavor instead of citrus. -A kick of Coriander. It was a happy accident because I accidentally dumped too much coriander in a batch! Over the last year, we’ve been experimenting with fruit on top of the coriander. -Chocolate Milkshake IPA. Dark chocolate, lactose, and lots of fruity hops. Thirsty Orange: What do you have in the tanks right now? Suit 104. It’s the room in the King Building that we originally started our tap room & brewery in. This beer is a throwback. Blonde ale that is fermented with pineapple, papaya, and guava. It’s super refreshing & easy to drink! The hammer & thistle. That’s a fun one to say while you’re drinking. Scottish export with a little peated malt. Metro double IPA. It’s called metro because me & 2 others drove up to Washington DC & bought an old metropolitan police van to our self distribution. We are the only self distributors in the tri cities. This double IPA is modeled after the 3 of us. The first letter of the 6 main hops represent the first letter of each our first and last names. Beer goes best with… Good conversation. Best time of day to drink beer is… While you’re finishing up brewing a batch of beer. The best part of drinking beer is… How it brings people together! 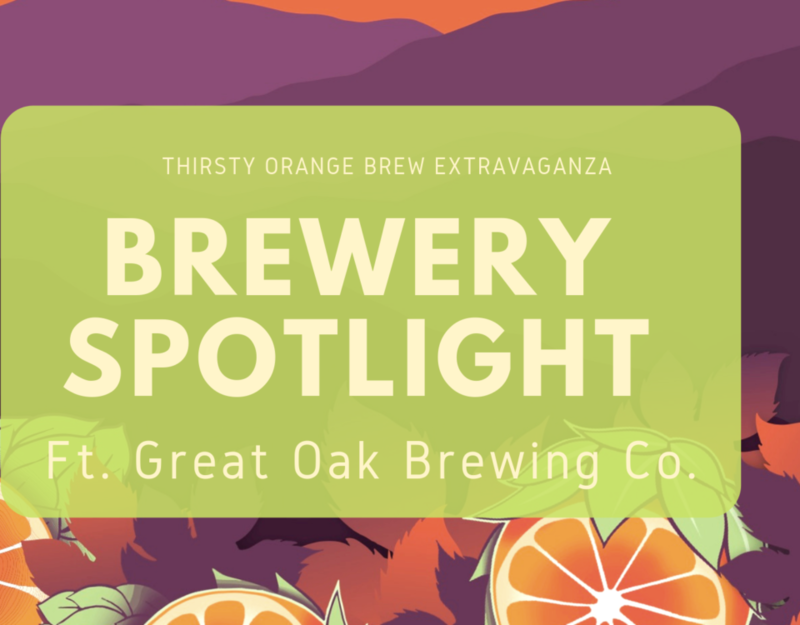 Brewery Spotlight ft Great Oak Brewing Co.
© 2019 Thirsty Orange Beer Festival. Presented by Super Fabulous Events. Site by Christian Schmid.